The local government of Navotas has finally revealed through it's Navoteño AKO! 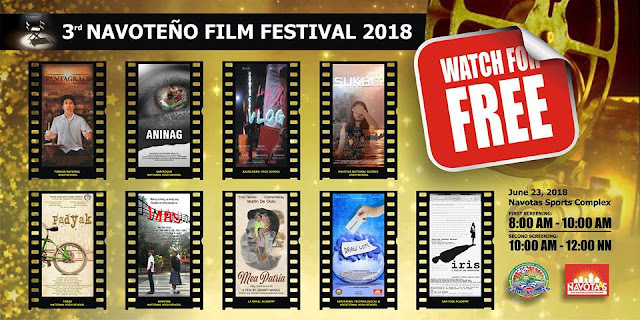 Facebook Page, the list of schools in Navotas and their entries who made it to the Annual Navoteño Film Festival, a short film festival contest open for aspiring student filmmakers in Navotas. Now on its third year run, the film festival still offers a variety of short films from young filmmakers across different schools in Navotas. The 3rd Navoteño Film Festival screenings will be held on June 23, 2018 at the Navotas Sports Complex. See screening schedules on the poster above or visit Navoteño AKO! Facebook Page for more details.